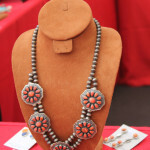 Collectors of fine Native American jewelry, art, hand woven rugs and Pendleton blankets will enjoy an unforgettable weekend among some of the Southwest’s finest Native American artists at Bazaar del Mundo’s “Santa Fe Market,” Friday, Saturday and Sunday, September 20 to 22 in Old Town. Diane Powers’ “Santa Fe Market” is San Diego’s prime destination for stunning and authentic Native American jewelry and home décor in bold shades of turquoise, coral, terracotta and orange. 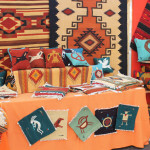 The festival, at the Bazaar del Mundo Shops, is a colorful outdoor marketplace featuring Navajo, Cherokee, Hopi, Pima, Isleta Pueblo and Santo Domingo Pueblo tribe members, along with other noted Southwestern artists demonstrating and selling their wares. The collections include: sterling silver and multi-stone inlaid jewelry of turquoise and coral, sculptures, Pendleton blankets, Native American graphic art, paintings and more. Jewelry aficionados will recognize Navajo jeweler and “movie star” Ray Tracey, who has appeared in “Seems Like Old Times” with Goldie Hawn and Chevy Chase and the 1980’s TV series “Lou Grant.” His colorful pieces include gold, turquoise and lapis stones, as well as feather, bear and horse motifs. Cherokee artist John Balloue will present his colorful giclées (fine art digital prints made on an inkjet printer). 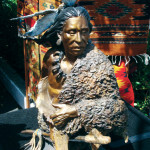 His work appears in public collections throughout the country including the Cherokee Museum in Oklahoma. In 1992, he was named Artist of the Year from the Indian Arts and Crafts Association. Multi-talented Bernie Granados, Jr. will present his paintings, masks, sculptures and miniatures featuring beautiful images of horses, buffalo and ancient ancestral figures inspired by visions and cave art throughout America. 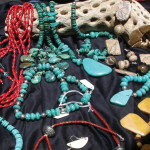 Santa Fe Market visitors can take in this dazzling showcase while enjoying live musical entertainment. Neighboring restaurant Casa Guadalajara will offer Southwest-inspired lunch and dinner selections. This entry was posted by The Bazaar del Mundo on May 7, 2014 at 8:24 pm, and is filed under Uncategorized. Follow any responses to this post through RSS 2.0. You can leave a response or trackback from your own site.